Here are some snazzy birthday facts about 25th of December 1954 that no one tells you about. Don’t wait a minute longer and jump in using the content links below. Average read time of 10 minutes. Enjoy! What day was my birthday Dec 25, 1954? December 25, 1954 was a Saturday and it was the 359th day of the year 1954. It was the 52nd Saturday of that year. The next time you can reuse your old 1954 calendar will be in 2021. Both calendars will be exactly the same! This is assuming you are not interested in the dates for Easter and other irregular holidays that are based on a lunisolar calendar. There are 246 days left before your next birthday. You will be 65 years old when that day comes. There have been 23,495 days from the day you were born up to today. If you’ve been sleeping 8 hours daily since birth, then you have slept a total of 7,832 days or 21.44 years. You spent 33% of your life sleeping. Since night and day always follow each other, there were precisely 796 full moons after you were born up to this day. How many of them did you see? The next full moon that you can see will be on May 18 at 21:13:00 GMT – Saturday. Fun stat: Your first one billion seconds (1,000,000,000) happened sometime on September 2, 1986. If a dog named Yellow - a Puli breed, was born on the same date as you then it will be 308 dog years old today. A dog’s first human year is equal to 15 dog years. Dogs age differently depending on breed and size. When you reach the age of 6 Yellow will be 42 dog years old. From that point forward a medium-sized dog like Yellow will age 4.5 dog years for every human year. Carrack Santa María captained by Christopher Columbus runs onto reefs off Haiti due to a proper watch not being kept. Local natives help to save food, armory and ammunition but not the ship. The Eggnog Riot at the United States Military Academy concludes after beginning the previous evening. The first in Europe artificial, self-sustaining nuclear chain reaction is initiated within Soviet F-1 nuclear reactor. The Stone of Scone, traditional coronation stone of British monarchs, is taken from Westminster Abbey by Scottish nationalist students. It later turns up in Scotland on April 11, 1951. Kilvenmani massacre, 44 Dalits (untouchables) burnt to death in Kizhavenmani village, Tamil Nadu, a retaliation for a campaign for higher wages by Dalit laborers. An Antonov An-72 plane crashes close to the city of Shymkent, killing 27 people. What does my birthday December 25, 1954 mean? Your birthday numbers 12, 25, and 1954 reveal that your Life Path number is 11. It is a master number that represents intuition, idealism and invention. You have the potential to be a source of inspiration and illumination for people. The following celebrities also have the same life path number: Elizabeth Allen, Rob Mills, Jaan Toomik, Sterling Holloway, Millie Perkins, Maurice LaMarche, Meg Bennett, Barbara Hershey, George Waggner, Luther Allison. 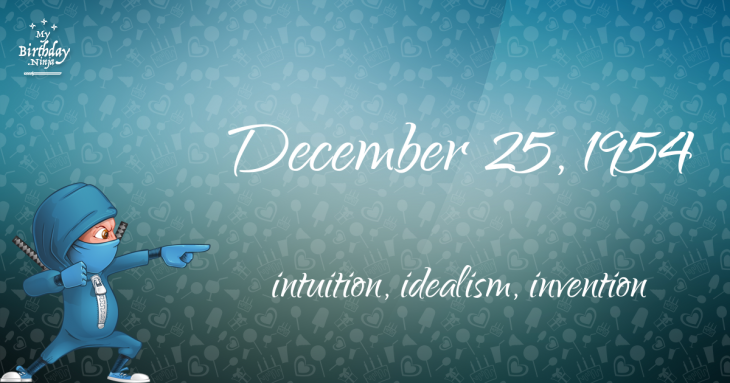 What is the birthday horoscope for Dec 25, 1954? The Western zodiac or sun sign of a person born on December 25 is Capricorn ♑ (The Sea-goat) – a cardinal sign with Earth as Western element. The ruling planet is Saturn – the planet of discipline. According to the ancient art of Chinese astrology (or Eastern zodiac), Horse is the mythical animal and Wood is the Eastern element of a person born on December 25, 1954. Fun fact: The birth flower for 25th December 1954 is Holly for precious moments. What is the Love Match for Dec 25, 1954? When it comes to love and relationship, you are most compatible with a person born on December 12, 1926. You have a Love Match compatibility score of +172. Imagine being in love with your soul mate. On the negative side, you are most incompatible with a person born on September 7, 1944. Your incompatibility score is -164. You’ll be like a cat and a dog on a love-hate relationship. Arf-arf, I want to bite you. Meow-meow, stay away from me! How many babies were born on December 25, 1954? Base on the data published by the United Nations Population Division, an estimated 98,513,524 babies were born throughout the world in the year 1954. The estimated number of babies born on 25th December 1954 is 269,900. That’s equivalent to 187 babies every minute. Try to imagine if all of them are crying at the same time. What is the popular baby name on 25 Dec 1954? Here’s a quick list of all the fun birthday facts about December 25, 1954. Celebrities, famous birthdays, historical events, and past life were excluded. 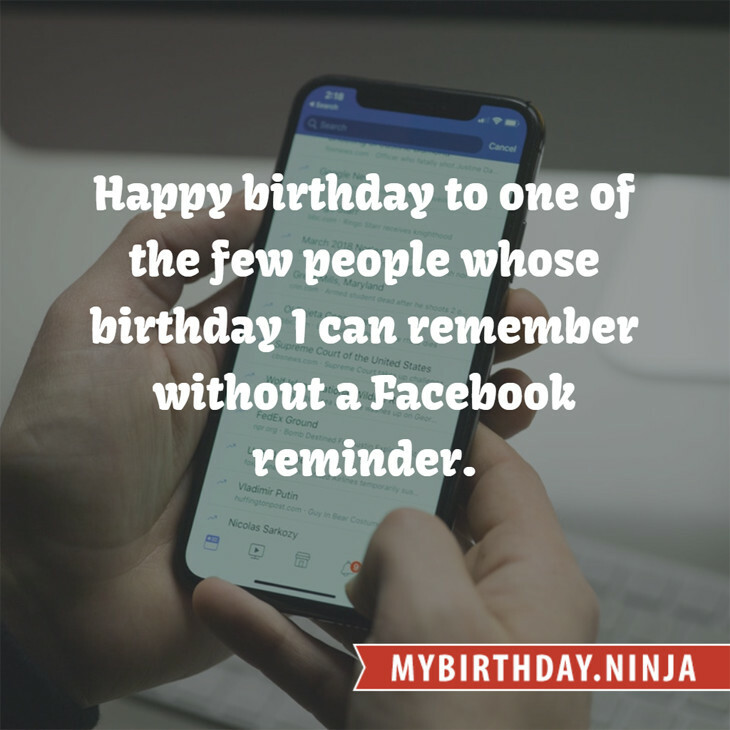 Try another birth date of someone you know or try the birthday of these celebrities: February 6, 1977 – Josh Stewart, American actor; October 17, 1912 – Jack Owens, American singer-songwriter and pianist (d. 1982); April 19, 1988 – Saya Yūki, Japanese actress.